With cruises, ferry crossings, and visits to several UNESCO World Heritage Sites, this breathtaking vacation features the best of Newfoundland and Labrador—with overnights in Corner Brook, Plum Point, L’Anse-au-Clair, St. Anthony, Rocky Harbour, Gander, Clarenville, and St. John’s. NOTE This vacation visits remote regions where some facilities are not up to the first-class standards you expect from Globus. However, we have selected the best available hotels that satisfy our high standards of cleanliness and comfort. Day 1 ARRIVE IN CORNER BROOK – Welcome to Corner Brook (local airport is Deer Lake)! 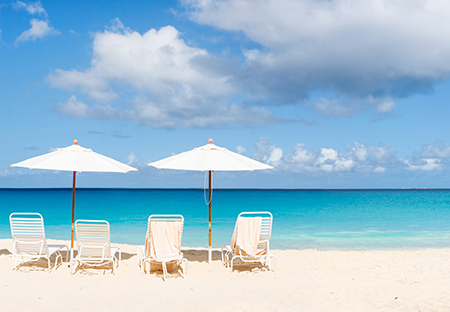 The remainder of the day is at leisure to explore the town or relax at your hotel. Day 2 CORNER BROOK – This morning, meet your traveling companions and Tour Director during a welcome breakfast. Then, enjoy an orientation tour of Corner Brook, followed by a break to see the Captain James Cook National Historic Site. Travel along Humber Arm to the Bay of Islands, with excellent photo opportunities on the way to Frenchman’s Cove. Enjoy a stop at Lark Harbour. Savor great views of Guernsey, Tweed, and the Pearl Islands on the return to Corner Brook. Day 3 CORNER BROOK–GROS MORNE NATIONAL PARK–PORT AU CHOIX–PLUM POINT – Skirt the shores of Deer Lake and head north to GROS MORNE NATIONAL PARK, a UNESCO World Heritage Site known for its exceptional beauty and unique geological features. At the Lobster Cove Head, visit the LIGHTHOUSE and the fascinating marine displays. Next is BROOM POINT, highlighting the history of Canada’s earliest fishing settlements. Depart for Plum Point, visiting a few important sites along the way. View glacier-carved gorges on the way to PORT AU CHOIX NATIONAL HISTORIC SITE. The exhibits focus on archaeological finds of Maritime Archaic and Dorset peoples who settled here before 2000 BC. Day 4 PLUM POINT–BLANC SABLON–RED BAY–L’ANSE-AU-CLAIR – Board your FERRY to cross the Strait of Belle Isle, known as Iceberg Alley, to Blanc Sablon. Then, to RED BAY, a UNESCO World Heritage Site, the first major industrial complex of the New World and home to a 16th-century Basque whaling station exhibit. Return to L’Anse-au-Clair. Day 5 L’ANSE-AU-CLAIR–L’ANSE AUX MEADOWS–ST. ANTHONY – FERRY back to St. Barbe. Enter L’ANSE AUX MEADOWS NATIONAL HISTORIC SITE, the only known Viking settlement in North America and a UNESCO World Heritage Site. A Local Guide shows you the reconstructed sod huts, explains how the Vikings lived, and you will see Norse artifacts dating back to 1000 AD. Day 6 ST. ANTHONY–ROCKY HARBOUR – This morning, travel along the Viking Trail, with a stop at ARCHES PROVINCIAL PARK to photograph the two large arches carved by the pounding sea. Then, board a ship for a scenic CRUISE on Bonne Bay. Relax as you take in views of Gros Morne Mountain, learn about the history of the small villages nestled on the shores, and keep a lookout for whales and bald eagles. Tonight, enjoy a special LOBSTER DINNER. Day 7 ROCKY HARBOUR–GRAND FALLS–GANDER – Depart for Grand Falls, with a stop at the SALMONID INTERPRETATION CENTRE, one of North America’s largest Atlantic salmon enhancement projects. This provides a great opportunity to see salmon migrating upstream (through underwater windows). On to Gander, once the international aviation crossroads of the world. Day 8 GANDER–TWILLINGATE–TERRA NOVA NATIONAL PARK–CLARENVILLE – Along the “Road to the Isles,” the local predilection for colorful language comes across with place names, such as “Too Good Arm,” “Virgin Arm,” and “Crow Head.” On the way to Twillingate, visit the PRIME BERTH FISHING MUSEUM and see the Long Point Lighthouse. With luck, you might spot whales along the coast en route to TERRA NOVA NATIONAL PARK. Spend the next two nights in Clarenville, situated in beautiful Trinity Bay. Day 9 CLARENVILLE. EXCURSION TO TRINITY & CAPE BONAVISTA – This morning, travel to historic Trinity, one of the oldest communities in North America, with its scenic harbor. Enjoy a guided WALKING TOUR and hear stories that bring this picturesque village alive. Continue to Cape Bonavista to admire the beautiful cliffs and coastlines. In Bonavista, learn how modern North America began when John Cabot made landfall here in 1497. A visit to RYAN PREMISES NATIONAL HISTORIC SITE commemorates the prosperous fishing industry from the early 1500s to present day. Day 10 CLARENVILLE–WITLESS BAY CRUISE–ST. JOHN’S – Rejoin the Trans-Canada Highway and travel to Witless Bay Islands, where whales and puffins abound. Board your boat for a narrated CRUISE around the three islands. Newfoundland has the largest concentration of humpback whales in the world, and is also known as the “Seabird Capital of North America,” with the largest Atlantic puffin sanctuary in North America. Continue to St. John’s, visiting CAPE SPEAR NATIONAL HISTORIC SITE en route, the most easterly point in North America. Day 11 ST. JOHN’S – Tour the oldest settlement in North America with a Local Guide. Visit SIGNAL HILL NATIONAL HISTORIC SITE, Cabot Tower, the Old Town, and the Basilica of St. John the Baptist. This afternoon is free to explore on your own. You may wish to visit The Rooms, where you can immerse yourself in the local culture through history, heritage, and artistic expression or spend time browsing the many boutiques and galleries of St. John’s. This evening, your Tour Director hosts a special farewell dinner that includes a traditional SCREECH-IN ceremony. Wonderful conversation and cuisine make the perfect finale for your tour. 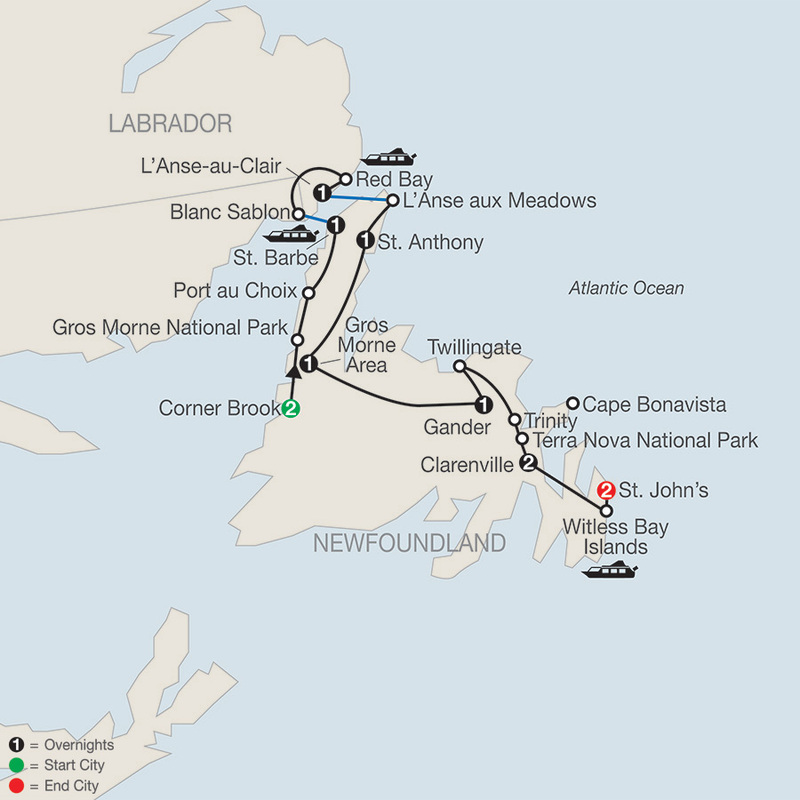 Day 12 ST. JOHN’S – The tour ends this morning with guests departing on individual schedules. Airport transfers are provided.